Antique Wood Cameras, Antique Cameras and Vintage Cameras, Antique Camera Shutters and Lenses. The cameras displayed here are from my private collection, they are of the highest quality. My collection includes: E & HT Anthony Camera Company, Greenpoint Optical Camera Brooklyn, Scovill Cameras, Scovill Adams, Scovill Waterbury Detective Camera, Simon Wing Ajax Camera, Rochester Optical Cameras including the uncommon Reko Camera , The Hub, Premo A, Long Focus, Empire State, New Model, New Model Improved, American Optical Cameras, Sunart Camera The Vidi 2, Manhattan Optical Wizard Camera, Lancaster Cameras, W. Watson & Son, Perken Son & Rayment, Houghton, Wood Cameras, Mahogany Cameras, E. & T. Underwood Instanto Tailboard camera, Kodak String Set Camera, Kodak Premo Camera, Kodak Ordinary A, Kodak Ordinary C Cameras, Kodak No. 3 String Set, Kodak No. 4 String Set Cameras, Kodak Cartridge Premo No. 00 Camera, Volute Shutter, Gennert, Dr. Nagel, Zeiss, Art Deco Cameras, Bakelite Cameras and Leica including rare Mountain Elmar Lens, Leica I, Leica II, Leica III, Leica Standard, UR Leica, Leica 0, Leica M, Leica Luftwaffen Eigentum, Shew Feather Weight, Pre - War Cameras, Post War Cameras, Stereo Cameras, Panoramic Camera, Empire State, Eastman Kodak Cameras and London Stereoscopic, Lizars, Lizars Challenge, Lizars Victor, Hermagis Paris, Blair HawkeyeCamera, Blair Detective Camera, Blair Tremont Camera, Blair Utility Camera, Blair Comdination Camera, Vive Camera, Post card Street Camera, Zeiss Tropen Adoro Camera, Darlot Lenses, Koilos Shutter, just to mention a few. My web site does not display my entire collection. If you are looking for a particular camera just send me and e-mail and perhaps I have it. Please feel free to e-mail me any questions or comments you have about my collection, by using the form on my home page. If you prefer click on the link below to send an e-mail. 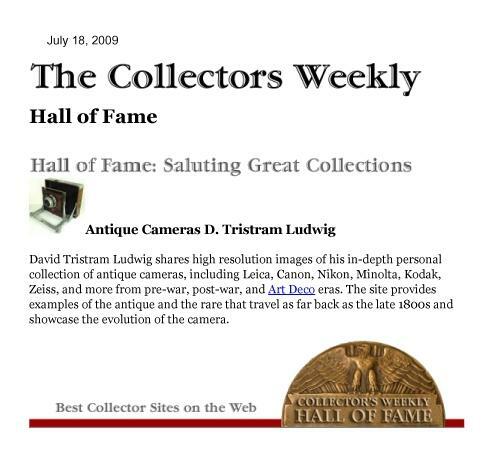 I sometimes list the Rare and Collector quality cameras from my collection on an auction site with Buy It Now price or a Fair Reserve. I do not sell from my site, I only list items for sale at auction. If you are interested in purchasing a camera let me know and I can list it at an online auction with a Buy It Now price if I am willing to part with it. All information about IDCC can be found by clicking on the link.